LaCie at the 2016 National Association of Broadcasters Convention (NAB) today unveiled a massive desktop RAID storage solution that offers a maximum capacity of up to 96TB. 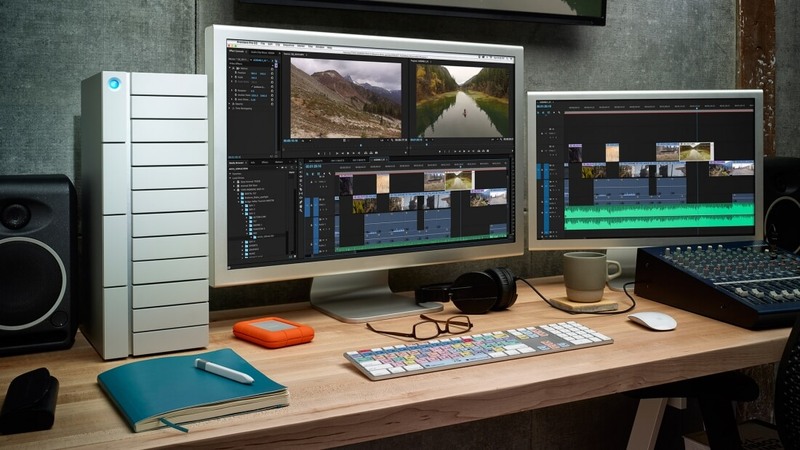 The 12big Thunderbolt 3 is a professional-grade 12-bay storage solution that more resembles the beige PC boxes of yesteryear than a hard drive rack. At up to 96TB of storage, LaCie claims its new tower boasts a 50 percent higher capacity than any other desktop direct attached storage solution on the market. As you might expect given its parent company, LaCie’s tower is populated with 256MB cache, enterprise-class 7,200 RPM drives from Seagate that offer a five-year limited warranty which covers drives, enclosure and spare parts. The drives are rated for 8,760 hours of operation per year (24 / 7 / 365). The front of the enclosure features drive status LEDs that keep track of drive health and RAID build status. Drives are accessed from the front of the unit. LaCie says it went with aluminum to help with heat dissipation which is aided by four temperature-regulated fans. Given its Thunderbolt 3 interface and hardware RAID controller, LaCie says the 12big is good for speeds of up to 2,600MB/s and 2,400MB/sec in RAID 5. The LaCie 12big Thunderbolt 3 will be available this summer in capacities of 48TB, 72TB and 96TB. Pricing hasn’t yet been disclosed but I wouldn’t expect it to be priced for mainstream / non-enterprise use.